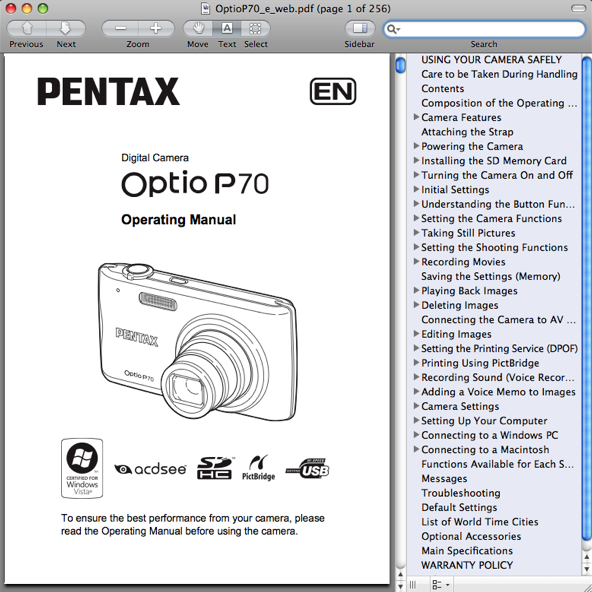 The English Language Pentax P70 user manual / operating instructions (Pentax calls it the “Pentax Optio P70 Operating Manual”) is now online and available for download at PentaxImaging.com (right-click and save the user guide to your hard drive). A Spanish version of the manual is also available. Unlike with Nikon, Pentax allows you to freely print the P70 owner’s handbook without building in any password protection into the PDF. The file size of 256-page Pentax P70 Adobe Acrobat PDF document is 5.3 MB (megabytes). The guide discusses the features of the P70 and how to use the camera. Instructions for using the supplied imaging software, ACDSee, is also provided. The version of ACDSee that is bundled with the P70 is ACDSee for PENTAX 3.0. Some highlights of the camera’s functionality from the P70 manual has been provided by GordonBGood in this forum post.